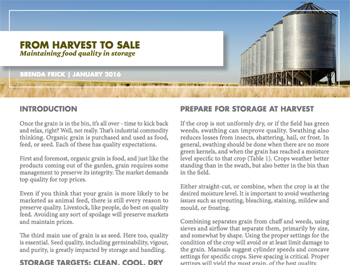 Acknowledgements: Thanks to Joanna MacKenzie, OACC, and Bruce Roskens, Grain Millers for collecting information that appear in this factsheet, for review of an earlier draft, and for helpful suggestions. This factsheet was improved by comments provided by Bruce Roskens, Joanna MacKenzie, Sam Godwin, and Iris Vaisman. Thank you. Always be careful around augers, and remember that grain can act like quicksand, collapsing and suffocating people in bins and trucks.